An international rescue mission is set to try to bring a mini submarine trapped in deep water in the Russian Far East to the surface. A British undersea robot has made contact with the vessel at the accident site, off the Kamchatka peninsula. The Scorpio craft has been attempting to cut the vessel free of the debris pinning it to the seabed. Seven submariners are trapped on board and oxygen supplies on the Russian submarine are beginning to dwindle. Ships in the water above the submarine have been moved to a safe distance so the craft can resurface. 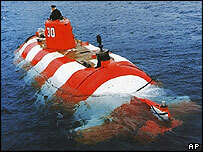 A spokesman for the British team said that the Scorpio was severing the nets trapping the mini-sub. "We are in the water and are now working around the sub, cutting a bundle of nets strung tightly around the arc of the propulsion section," Roger Chapman told the BBC's World Today programme. The Russian Priz submersible - itself a rescue vehicle - was on a training exercise when it got snagged and trapped underwater on Thursday. 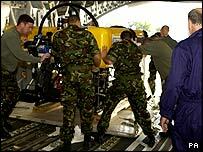 Mr Chapman said freeing the mini-sub could allow it to travel back up to air level. "Once the debris is clear, if the crew are able to operate their equipment, they can do a controlled ascent," he said. The Russian navy has so far failed in its rescue attempts to extricate the Priz which sank to a depth of 190m (620 ft) after the accident. Initial reports said the vessel was trapped in vast fishing nets but later it emerged that the sub may also be snagged by an underwater antenna, said to be part of a coastal monitoring system. The sub's very heavy anchors are also hampering efforts to move it. There have been contradictory reports about how much oxygen is left on the Russian vessel. Naval officials said they were keeping in touch every hour with the crew through acoustic signals. All are said to be unharmed. They are reported to be coping with temperatures of around 6C (43F) and a shortage of oxygen by wearing thermal suits and minimising movement. Russian Pacific Fleet commander Admiral Viktor Fyodorov said work is continuing round the clock "and will not stop until we actually lift our guys up to the surface". The BBC's Sarah Rainsford in Moscow says the confusion surrounding the rescue is making the scenes eerily familiar. Almost exactly five years ago, the Kursk submarine sank after explosions on board, killing all 118 men on board. This time too, it took more than 24 hours before the navy admitted to an accident and longer still to ask for help, our correspondent says. Some of the sailors survived the initial blast, but ran out of oxygen. The authorities then were accused of a cover-up.